**AS OF DECEMBER 7, IF YOU NEED YOUR ORDER BEFORE CHRISTMAS AND DID NOT PAY FOR EXPEDITED, IT MAY NOT ARRIVE BEFORE THEN** This is due to the high volume of shipments during the holiday season around the country. Feel like you’re at the spa in your own home with these lovely kimono-style waffle robes! Soft and cozy, you’ll want to lounge around in them all day. They make a perfect gift for your bridesmaids, and they’ll be able to use them for years to come! Also a perfect wedding shower gift or wedding gift! Many personalization options and trendy wedding colors and embroidery options. Plus, 7 day processing! Waffle weave, tailored collar, self-tie wrap belt, and two patch pockets. 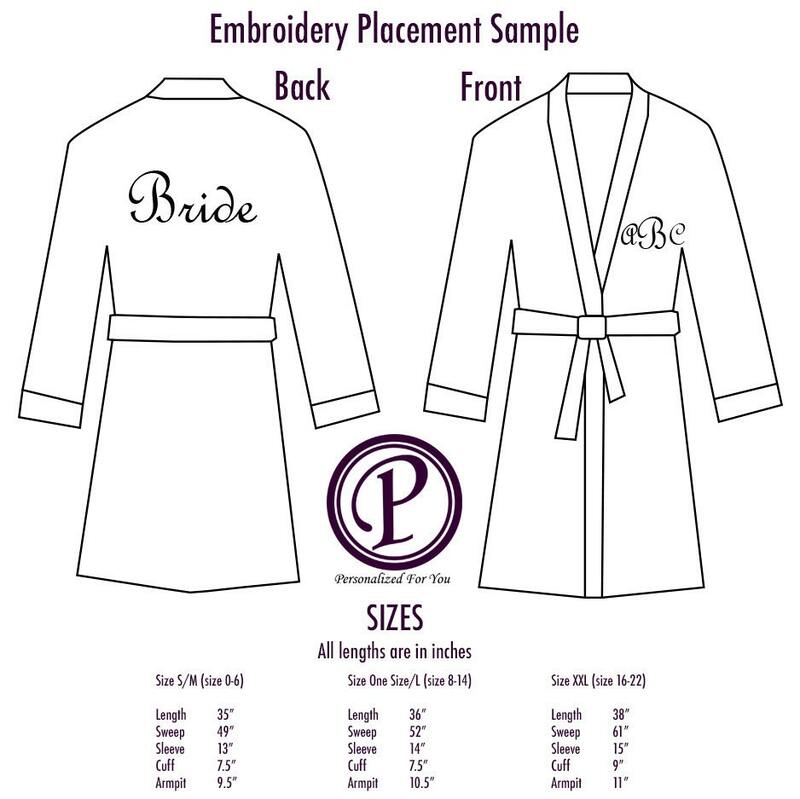 All of our robes are personalized with a monogram, overlay, or a name. Get creative! If it has 11 characters (including spaces and punctuation) we can put it on a robe! 1. 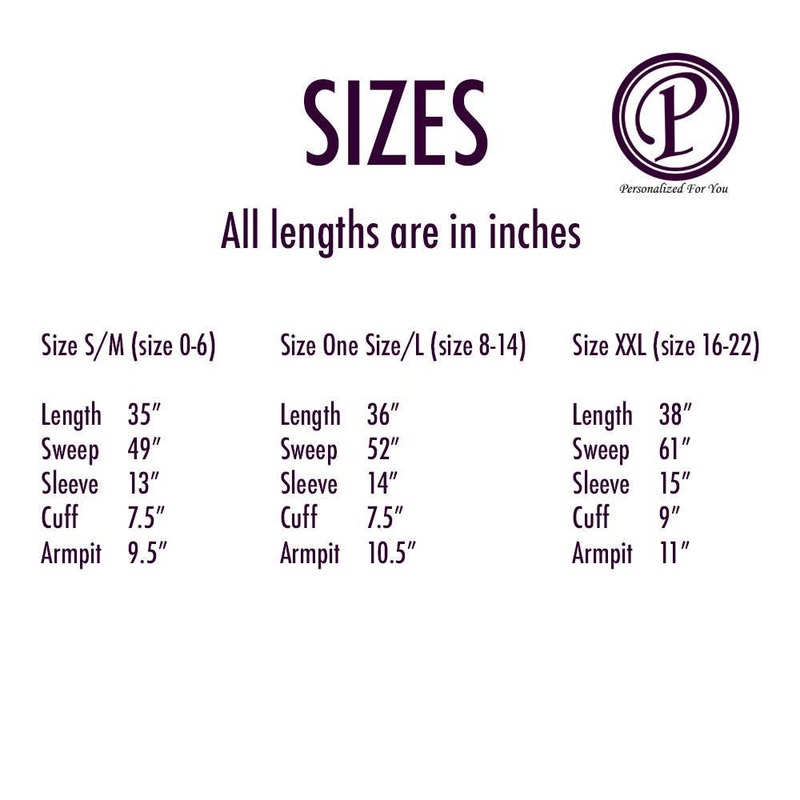 Size of each robe. 2. Location of embroidery. The image above shows you where the embroidery is placed. Please indicate which location you want your text to be on by selecting the proper option in the “Variations” panel during checkout. 3. 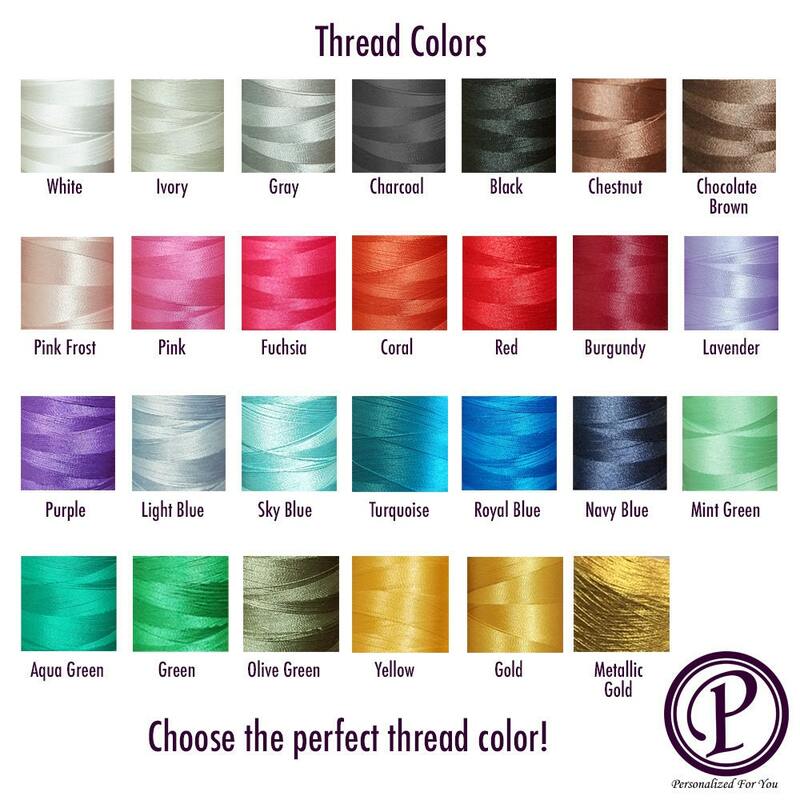 Thread color. For color options, please see the image above. 4. Monogram, Overlay, or Font option. See the image above for monogram and font options. 5. Name, Overlay, or Monogram initials. 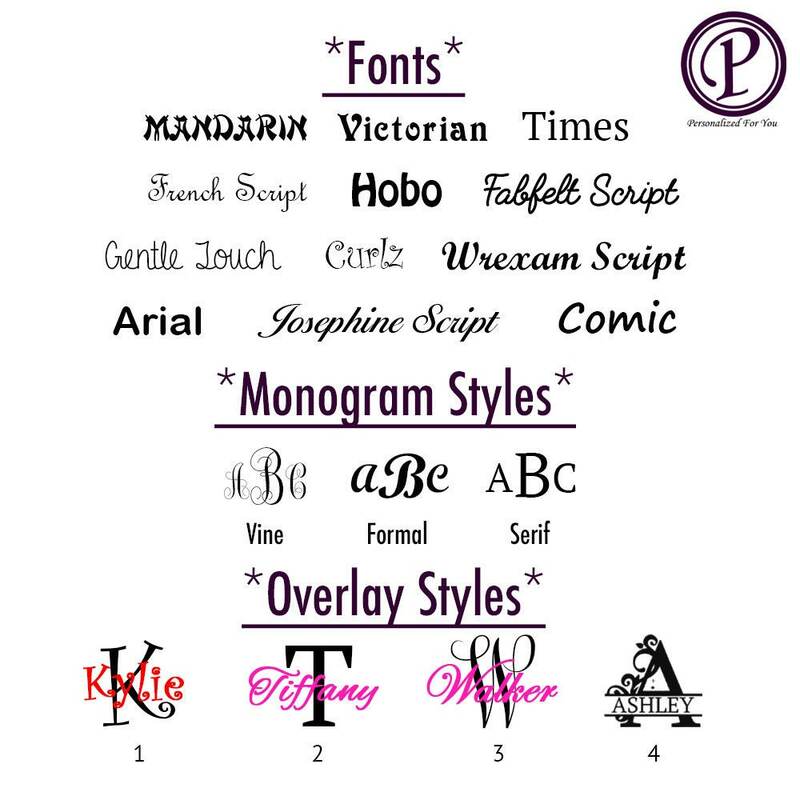 Please make sure that you write the monogram initials in the way that you want it embroidered. Traditionally, it’s usually in this order: First Name Initial, Last Name Initial, Middle Name Initial. The last name initial is in the center and a bit larger. So the name Michelle Anne Smith would read MSA, with the S being the largest. The embroidery is done in the exact order that you provide the initials in, so please ensure they are in the correct order. Please make sure that you spell any text in the exact way that you want it embroidered. You need to choose 2 thread colors for most of the overlay options. An overlay consists of an initial in one thread color, and a name or text in a second thread color that is embroidered on top of the initial. The exception is option 4, the “Ashley” option, in which case you only choose 1 thread color. Please make sure that you spell any text in the exact way that you want it embroidered, and if you are using 2 lines, please indicate which text goes on the first line, and which goes on the second line. Remember that each line can only hold 11 characters including punctuation and spaces. If you have any questions, don’t hesitate to ask. We want to help you get your order right! Please TRIPLE CHECK your your order before you submit it. Once processing begins, we are unable to make changes. All orders are delivered in the continental US in 2 weeks. There is an additional charge for expedited shipping. If you need your robes sooner than 2 weeks, choose expedited shipping from the menu when placing your order. For international orders, if there is a difference in the price to ship to you we will contact you to pay the difference before shipping your order. If you need expedited international shipping, please contact us before you make your purchase and we will let you know how much it will cost. All items are final sale. We apologize, but we cannot accept returns on the robes. Please be sure that all of your questions have been answered before you place your order, and that you have triple checked all of the information in the notes section of your order. It very rarely happens, but in the case of a package that is missing, we can't accept responsibility for a third party's errors.